At first glance this late nineteenth century village seems picture perfect. However, this close-knit community lives with the frightening knowledge that a race of creatures resides in the woods around them. 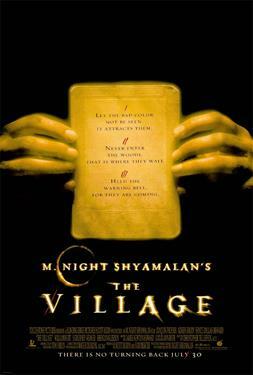 The villagers share the fear of the evil and foreboding force that lurks outside. So frightening that one dare not venture beyond "The Village" and into the woods. Despite the advice of his elders, a curious and determined Lucius Hunt has a burning desire to step beyond the boundaries of the town into the unknown. Town leader, Edward Walker warns Lucius of the danger amongst the town's outskirts, and Lucius' mother, Alice Hunt advises him to stay at home and spare himself of the greed and desires that exist in the outside world. Lucius' strength is matched only by Ivy Walker, a beautiful and mesmerizing blind woman with an unusual wisdom beyond her years. Her fearless nature and gift-like perception are beyond anything Lucius has ever known. Both Lucius and the mischievous Noah Percy admire Ivy passionately, though her heart only has room for one of them. Her devotion eventually leads her down a forbidden path where terrifying truths are revealed. The ominous presence of the unknown boils over into chaos for the town, with one's bravery being the only thing that can save them. The truce between "The Village" and the creatures is ending.